Listed at 250 pounds, LeGarrette Blount is just a pound lighter than the Patriots' starting fullback, James Develin. He's not exactly a scatback. He's more of a supersized bowling ball over which someone had draped a jersey—a "north-south" runner, in scouting parlance, who in last night's 43-22 New England victory rolled northerly and southerly all over the face of the Colts. Rainy conditions normally encourage teams to run more than usual, but the Patriots took it to an extreme, calling 44 total running plays. Blount was up to the task, rushing 24 times for 166 yards and four touchdowns—the first time in NFL history anyone has recorded over 125 rushing yards and four touchdowns in a playoff game. Even fumbly Stevan Ridley got some run, picking up 52 yards and two scores. It was Ridley's mistakes during the season that led the Pats to give Blount a bigger role as the playoffs approached, and seeing Ridley out on the field yesterday, the salt truck coming in behind the snow plow, was a reminder that Blount was once nothing more than a contingency plan. When the Patriots dealt for him during the 2013 draft, giving the Bucs a seventh-round pick and kick returner prospect/track star Jeff Demps in return, it wasn't exactly a blockbuster. Tampa Bay already had an electric starting back in Doug Martin, and Blount was in his final contract year; it made sense to ship him out. When 53-man rosters were finalized back in August, Blount was at the end of the depth chart. But Ridley began carrying the ball with oven mitts, and Shane Vereen hurt his groin, and that's how we wound up with an afterthought trampling the Colts in a playoff game. There's another advantage Blount has over the other, superior postseason running backs: fresher legs. Read that previous paragraph again. Blount saw just 289 snaps during the regular season. Other backs like Lynch and Knowshon Moreno took over 700 snaps each. Meanwhile, Blount suffered no major injuries and put less than half a season on his odometer, an important thing for a runner whose style embraces contact. Tom Brady will likely carry a little more of the offense next time out, whether against the Broncos or the Chargers. He threw only 25 passes against the Colts and didn't even net 200 yards. 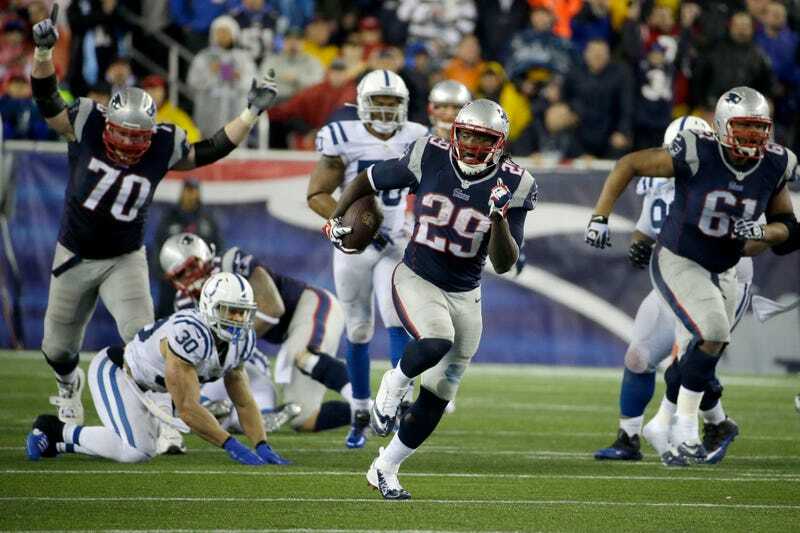 But Blount's game last night was a big, rolling declaration that the Patriots have other options.